How do I edit a peer-to-peer fundraiser's profile on my campaign? Navigate to your admin dashboard, by clicking the “You” in the top right corner and then clicking “Admin Dashboard” for your organization. If you are an admin of more than one organization make sure you click the one you want to manage your peer-to-peer fundraisers on. From the "Overview Tab" of your "Admin Dashboard" navigate to the campaign that you're fundraisers are participating in by clicking the "Campaigns" box. From the "Campaigns" tab, click the "Manage" button for the campaign you would like to work on. This will take you to your "Campaign Manager" where you'll want to navigate to the tab that says "Fundraising Champions" at the top of the page. From the "Fundraising Champions" Tab of your "Campaign Manager" click the Pencil Icon under the "Actions" Column next to the fundraiser's name to edit their profile. Tell Your Story: Here is where you can add a personal story of why your fundraiser is supporting your cause, or add a more general message for all of your fundraisers. Set A Goal: Here you can customize your fundraiser's monetary goal that will appear on their fundraising pages. Your Story Image: Here you can add a photo of your fundraiser volunteering, attending an event, or anything else that speaks to your campaign's mission! Video Link: Instead of an image, you can also choose to embed a YouTube or Vimeo video right on your fundraiser's profile. 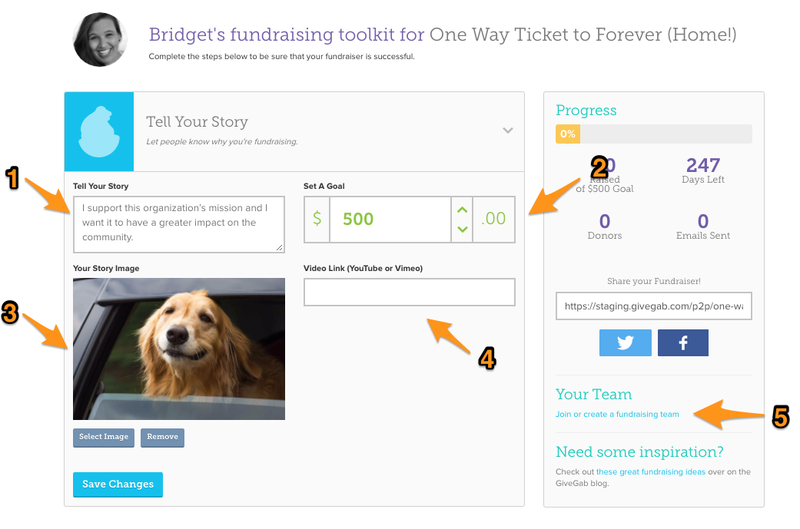 Your Team: Here you can choose to add the fundraiser to an existing fundraising team, or get them set up on a new one! Once you've finished customizing your fundraiser's profile click the "Save Changes" button and your fundraiser's profile will automatically reflect the changes you've made!